Instructions: Enter password in Password Box in the right column or PREVIEW RELEASE with SoundCloud above. Information: When you are going through the process of making a new album and along the way, industry veterans who have heard it all, begin to say "Wow! "...you know you're doing something right and creating something that listeners are going to respond to as well. Crosby Lane has captured that kind of experience in their new single, "Crucified"! The video single was released in January 2016 and landed in the GAC TV rotation, along with numerous other networks and programs including CMT.com. FULL ALBUM VERSION and RADIO EDIT downloads are available for programmers. through Mansion Entertainment with distribution through Sony RED. 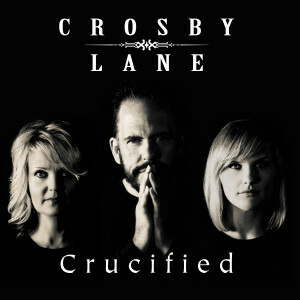 Their new album is a continuation of Crosby Lane's eclectic rootsy Gospel style.The title track, "Crucified" was written by group members John and Michaela Lemonis and features the dobro stylings of Rob Ikes. Video Release Via Social Media: "Crucified"